those "yard-bird" chores . . .
From the first moment you mount the Simplicity 725, you'll realize it is truly . 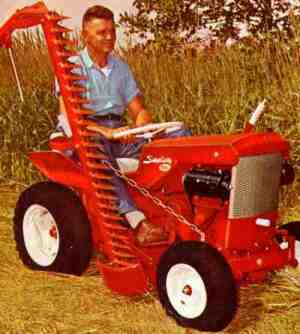 . . the finest, most dependable riding tractor in America for handling the greatest number of lawn and garden jobs. A peerless power-package, the Simplicity 725 helps you in hundreds of ways . . . never flinches on the tough jobs . . . isn't even "winded" long after others quit . . . yet handles gently as a lamb. Make sure your dealer puts this unexcelled tractor through its paces for you -- you'll be watching the most advanced riding tractor in America perform. 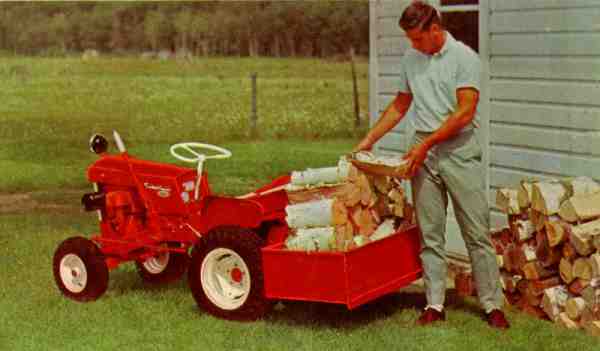 The tough, talented, tireless Simplicity 725 does the job better all year long. 46" SICKLE BAR -- Makes short work of heavy growth even over rough terrain and steep slopes. 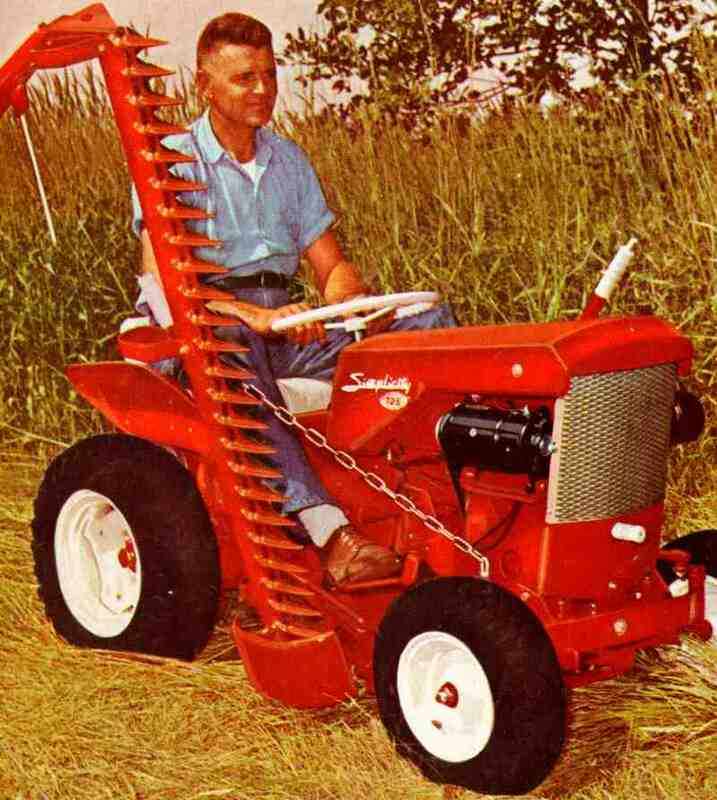 Cuts 1.2 acres per hour in high gear at half throttle. Side mounted between front and rear wheels in minutes, without tools. Mows from near vertical position to 40 º below horizontal. Spring mechanism protects knives from obstructions; recouples without operator dismounting. (Requires No. 211 power take-off) Model No. 210. Ship wt. 122 lbs. CARRY-ALL BOX -- Easily carries 350 lbs., yet attaches to the back of 725 with only three pins! Removable tail gate for loading ease. Heavy 16 ga. steel box and heavily-reinforced supporting structure insure long life. Only 10 x 20 x 40", it stores in a small area. Model No. 274, Ship Wt. 50 lbs.